Half sarees are traditional sarees worn in South India by young girls. It is a two piece saree also called as a half saree or half lehenga. It is worn by young girls on some special occasion. It is also called as langa voni in Telegu, Pattu Pavadai Davani in Tamil and Langa Davani in Kannada. This outfit comprises of three components, a choli or blouse, skirt and a long dupatta. The skirt also called as Langa is tied around the waist with a string, the Voni also known as dupatta is usually 2-2.5 metres long which is draped across the blouse. This outfit has meaning to wear in the South India. It displays the transition from childhood to adulthood. Usually children wear less complicated cloths like skirt and top, whereas women wear complicated sarees; in order to balance the complication, young adults wear less complicated half saree. On reaching puberty, women celebrate it by wearing a half saree gifted to her by her grandparents. The half sarees are made and designed in the same way as normal sarees. Many fashion designers have brought light to this traditional outfit and created innovative designs and patterns. This outfit is made out of silk or cotton. Common design elements are border work and zari work on the saree. This outfit has gained immense attention in the fashion world and are now created in a western way as well. This outfit has gained popularity from many bollywood movies as well. 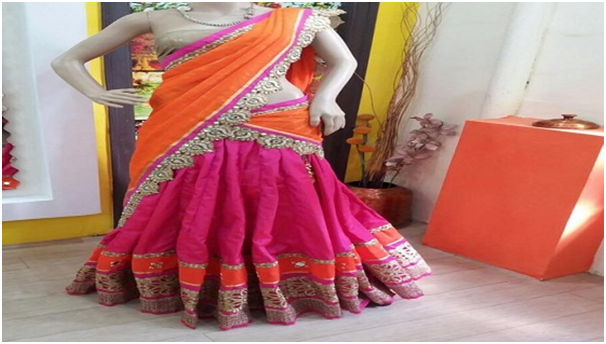 A half saree need not be draped, folded and coaxed into creating a right shape and fall like a normal saree. It can be easily carried off compared to a normal saree. It is low maintenance outfit. Now a day, this type of a half saree is very trending amongst the youth. The easy to wear and stylish look makes it a pretty trendy look for occasion and events amongst the youth. There are 5 concepts of half sarees which are trending now a day. The Kalis Styled Half Saree: - In this style the drape is made up of net or georgette and lower drape is made up of pre-stitched pleats in kali form to make it look like a saree. It is an easy to drape saree which is most common in weddings. The Panelled Half Saree:-It uses different fabric and colour. In this style the lower drape is styled in horizontal panels of different fabric or colours. Normal Half Saree: - Normal half sarees may be created with textured fabrics like net in drape or net throughout in 2 colours with embellishment and shade variations. A new trend of prints in pallu or lower drape along with the solid colour is going on. Cutwork Half Saree: - In this style, the upper drape i.e. the pallu is made up of intricate motifs or embellishments whereas the lower part of the saree is a plain colour or variant shades of the same colour and vice versa. This designer piece definitely wins the heart of all ethnic lovers. Three Sectional Half Saree: - As the name says, the theme is to use three different fabric or colours or styles in three sections of the same saree. It is trending in the fashion and film industry. Pastel Shades Sarees:- This season there is nothing bad in adopting the royal trends. The pastel shades are perfect to depict your elite style. Wear it with jewellery to complete your look. Best of designer collection could be availed from online store.